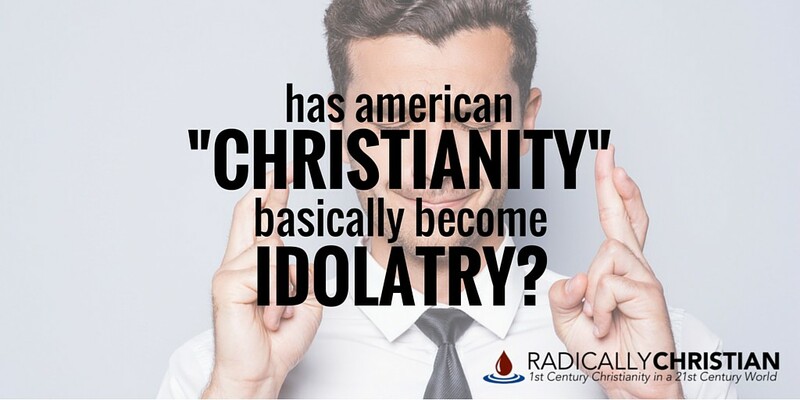 Has American “Christianity” Basically Become Idolatry? An idolatrous god is simply a means to an end. The ancients would worship a fertility goddess in order to be fertile. They would make sacrifices to the god of war in order to have victory on the battlefield. They would try to please the god of the seas in order to ensure a safe voyage. The God of the Bible, on the other hand, is not worshiped as a means to an end. God is to be worshiped because He Himself is the end; He is the object of our pursuit. We are told to seek Him in order that we might find Him (see Acts 17:27; Hebrews 11:6). Not in order that we might find all the physical things – or even eternal things – we want. But many of us have turned God into a means to an end. We are worshiping Him and serving Him in order for Him to give us the things we want. And it isn’t just the “health and wealth” preachers who think this way. Even when talking about heaven, many use terms like, “That big fishin’ hole in the sky.” They worship God because they see Him as the One who can provide the stuff they want, now and for eternity. But God is not just a gift giver, He Himself is the gift! If you are just seeking the things God can give you, and not God Himself, then you don’t understand the God of the Bible. If you don’t see that the greatest blessing of Christianity is reconciliation with God (see 2 Corinthians 5), then you really don’t understand the Gospel! An idol is a man-made thing and the god it represents is also man-made. Therefore it can be personalized to whatever the idol-worshiper wants it to be. An idol is a personalized god. The God of the Bible is a personal God, but He is NOT a personalized God. He is a personal God because He knows and loves us personally, knowing every hair on our heads (Matthew 10:30). And He is personal because He cannot be worshiped, served, or obeyed vicariously. In order to be a Christian, a person must personally believe in and follow Christ. However, many in our culture have tried to personalize God, the way we personalize everything else in our culture. We want to have everything our way. We want to decide the color, shape, and size of everything in our life. We don’t want our things to match our neighbor’s things; we want our stuff to be personalized. Likewise, we have tried to personalize our God. Statements like, “Well, I just don’t believe in a God like that” pass as legitimate theological arguments in our culture. It seems we actually think we can choose who God is. Biblically, of course, that’s not how it works. God is God and we are not. He doesn’t need my permission, or your permission, to be who He is! Not only do we have many false teachers today, but many of us actually do this to ourselves without realizing it. We open the Bible, pull a verse completely out of context, and act as if that verse is our “fortune cookie” for the day. Consider the popular verse Jeremiah 29:11, “For I know the plans I have for you, declares the Lord, plans for welfare and not for evil, to give you a future and a hope.” We act like this is a promise to us, but the verse is actually talking to the Jewish people, letting them know that many of them would suffer and die in Babylonian captivity, but as a people God wasn’t done with them yet. If we want to get to know the actual God of the Bible, His will for us, and His scheme of redemption, we can’t treat the Bible like a box of fortune cookies. But sadly, many don’t really want to know the God of the Bible; we just want the god we’ve created in our own minds to give us an inspirational quote of the day. The bottom line is this, it is easy to create your own god without even realizing it. It’s even easy to call His name “Jesus.” But that doesn’t make what you’re doing Christianity. Christianity is about discovering truth. It is about being brought into fellowship “with the Father and with his Son Jesus Christ” (1 John 1:3). It is about seeking Him and His will. It is about bringing glory to Him. It is about dying to self and living for Him – and with Him – for eternity.